If you never try another Pumpkin Cheesecake bar, this will be your go to last dessert recipe you will try. These scrumptious cheesecake bars are the best ever! If you're a pumpkin pie lover and non bakers, these will amaze you how delicious they are! There's nothing to make them and you don't have to be a baker at heart. This is a simple semi homemade recipe anyone can make and it's tried and true! If you love pumpkin pie and are not fond of baking, these are an easy bar with a pumpkin cheesecake filling that are semi homemade! Yes, a treat that anyone could make because they are the easiest pumpkin cheesecake bars on the planet! I couldn't believe how easy and quick these cake together and what a decadent little bar these are. Everyone raved about them, asked for the recipe and ate more than one! We love cheesecake bars, maybe you remember my summer Blueberry Cheesecake bar? Every year I made a dessert for Halloween night, these were my first try at them. They were such a hit, my family asked for them on Thanksgiving. Being I work all Holidays in Retail, this was a win, win for everyone, fast and easy dessert. Thanksgiving pies were so much more work and these did the trick in flavor. Actually, my husband liked them better than a piece of pie, plus they are a grab and go kind of dessert. It's so much fun roasting a whole pumpkin in the slow cooker. Then I have puree all year long in the freezer to make pumpkin recipes, pumpkin cookies, pumpkin sweet scones, even savory pumpkin scones and much much more. Don't forget to use the pumpkin seeds and make some savory pumpkin seeds as a snack too! Even our grand children love pumpkin puree, so you can even use puree for baby food! Of couse if you have plenty of time try my Homemade Pumpkin Pie recipe. These pumpkin cheesecake bars have such a creamy filling. A few things I do is bring the eggs and cream cheese to room temperature. That makes the filling very smooth and creamy with no lumps. Also for easy removable in the pan, I line my pan with parchment paper. Easy to cut into squares and no mess to clean. Store in a large covered rectangular storage container in the refrigerator. We prefer these cheesecake bars, cold or at room temperature. We love pumpkin flavor pretty plain as these are written. If you love chocolate chips, coconut or nuts, add more to your batter. Dress them up anyway you like, also if you don't like the added sweet topping, leave it off. The drizzled frosting on top made them look super special for the Holiday table, but it does add additional sweetness. You can decide how your family loves pumpkin cheesecake bars by just adding the additions to just one side and make half plain and half with those previous suggestions. Do You Want To Try More Pumpkin Recipes? A delicious little cheesecake bar made with pumpkin and spice and oh so nice! Line a brownie 14 x 10 or jelly roll pan with parchment paper or use a non-stick spray. In a large mixing bowl, on low speed, combine cake mix, 1 egg, butter, and cinnamon until it form a dough, I used a flat beater with my electric mixer. Press onto bottom of prepared pan. Using a clean bowl and electric mixer, with the flat beater, beat cream cheese until fluffy. Add in the sweetened condensed milk, remaining eggs, pumpkin, spices, and salt mixing till evenly blended. Pour over crust, ( I sprinkle pecans just with half since not everyone likes nuts in my family). Bake 35 to 40 minutes until the middle is set. Cool, then chill in refrigerator. Cut into squares. Refrigerate leftovers. Drizzle frosting just before serving. Sprinkle with more pecan nuts if desired. Don't forget to try making your own Pumpkin Puree, it's easy in the slow cooker and so good! 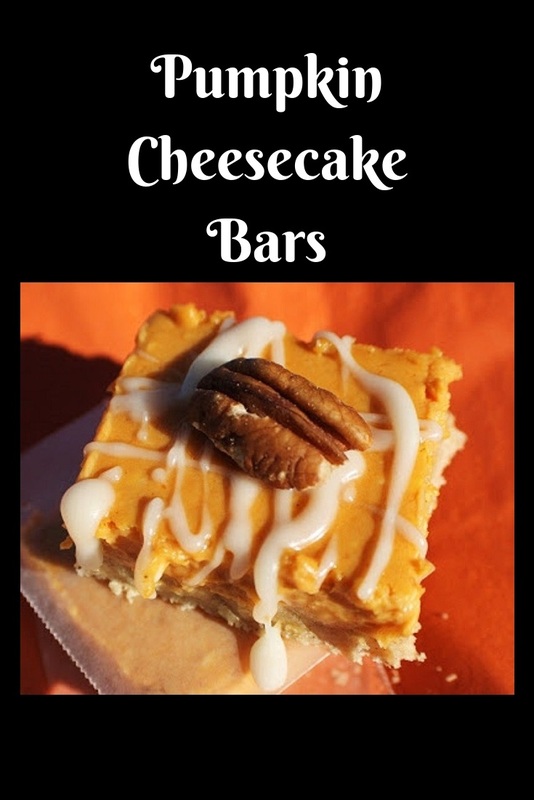 Pumpkin cheesecake is an awesome dessert, but with a small family it just isn't in the cards so these bars are perfect. I love the way you topped these-that drizzle and the pecan really hooks you-I want one-yum! Thanks for sharing this one-we can all appreciate a tasty treat that does not require hours in the kitchen! What a delicious twist on my family's favorite gooey bars...YUM! Mmmm, I love cream cheese. Especially if it's got a pecan on top! I was going to make a joke walking into a pumpkin bar, but I couldn't decide which punch line to use the one about the place being to seedy, the one about the pumpkins get lit or the one about the pumpkins getting faced. Instead I decided to just squash the whole idea. Any way these sound awesome! This looks delicious and I must try this. Your photos are awesome! I can see why he loves them! They look completely irresistible! Those cheesecakes bars look super scrumptious, love the drizzled frosting, yum! These look delectable! Pumpkin cheesecake is so good! Wow! These are so creative. I just made cake batter cookies, but have never had cake batter cheese cake. And I LOVE anything with pumpkin. This would be wonderful. BUZZ! Using cake mixes sure makes life easier. 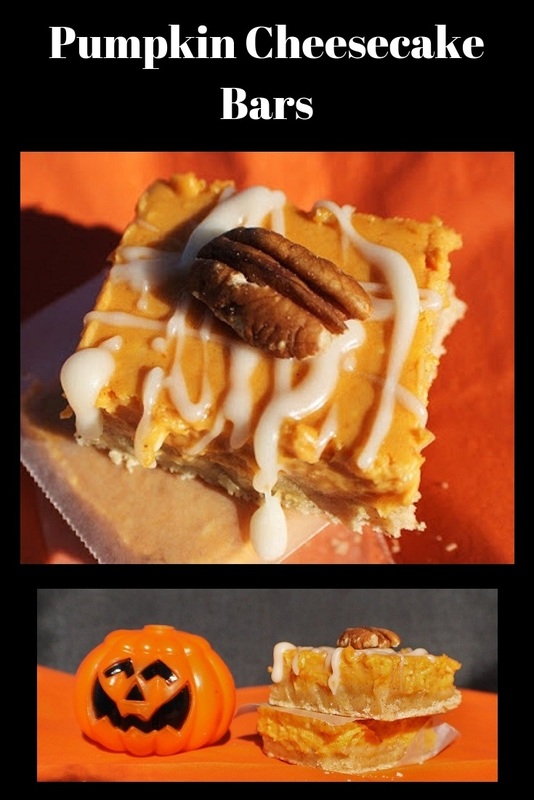 Love the creativity of this droolworthy delicious pumpkin bar...so ooey, gooey yummylicious! The drizzle is an added treat! Pumpkin and cheesecake. Two of my favorite things!! These bars look so yummy! Your husband has good taste! What sweet delectables they will be to have out on Halloween and Thanksgiving. And thank-you for finding ease - I need ease in my life! Pumpkin cheesecake, I think I would like these! Cheesecake isn't my favorite, but I love pumpkin everything! looks so easy to prepare and delicious...lovely mouthwatering dish! Oh wow, these look good! I look forward all year to a slice or fifty of pumpkin pie on Thanksgiving. But with these, I can make them whenever because hey, they're cookies right?! YAY!! These sounds like such a wonderful fall treat Claudia! 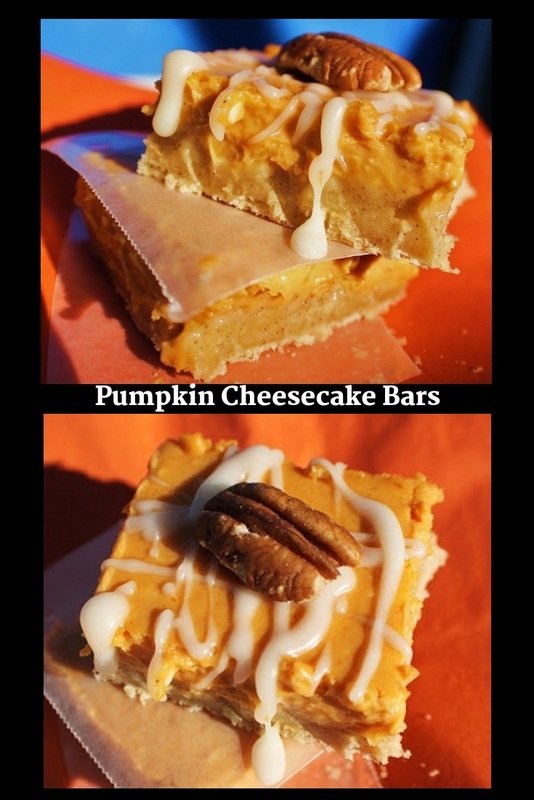 These really do look like the best ever pumpkin cheesecake bars! This looks so YUMMY! Can you tell I love desserts?!? Thank you so much for adding me to your blog roll. We need to get together soon. Thanks for the recipe! These are delicious! I've made them for friends and passed your recipe along. We all love them! What a delicious dessert that's perfect for fall! I love pumpkin cheesecake. I wish I had a piece right now. 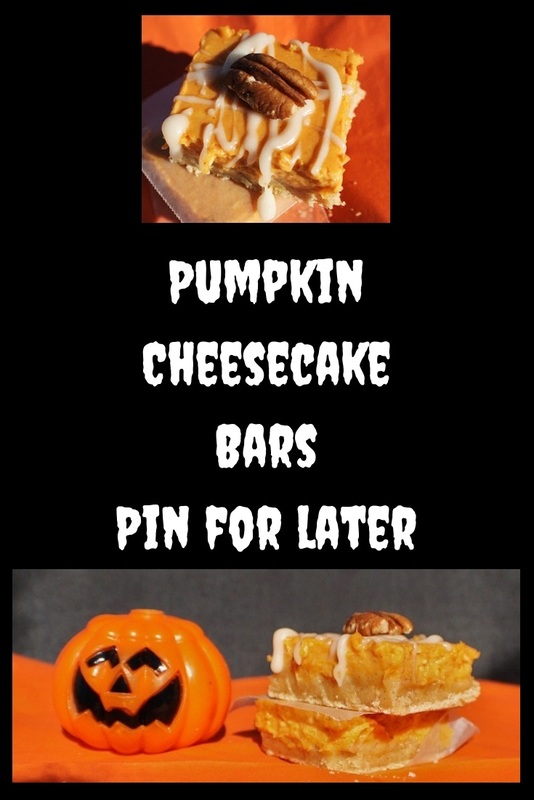 I love pumpkin and I love cheesecake so this seems like the recipe for me! I like the bars for parties. Good job! These look so tasty! 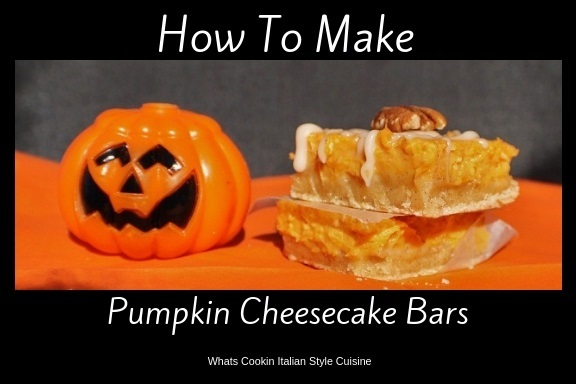 I am crazy about pumpkin and the cheese cake texture with it must be amazing! I am giving this a go ASAP! 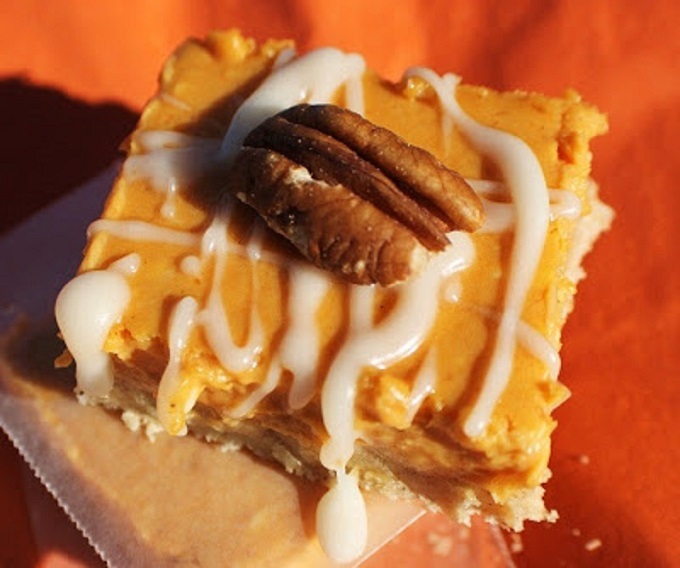 What a delicious Pumpkin Cheesecake bar! I simply cannot wait to try it! Very interesting combination of ingredients. I am saving this recipe for later. I am such a pumpkin fanatic. I also love cheesecake. Combining the two makes a mouthwatering treat. Perfect for our upcoming Canadian Thanksgiving next weekend. What a great dessert. Very nice presentation and these colors are incredible. Great recipe. I am going to try this out. THANK YOU! Give me all the pumpkin! I seriously can't get enough this year and these bars look so scrumptious!! I make a pumpkin cheesecake during the holiday season that everyone always gobbles up. This is a fun take and it sounds like it's got an intriguing taste and texture. These bars look so inviting! I love how creamy they are and how easy to make! So delish! What great looking pumpkin bars -- they're coming at a perfect time. I love the flavors you have plus the spices. I don't think I'd need to add coconut or chocolate chips to them. They are perfect as is. I'm pinning. Pumpkin is my favorite seasonal flavor so I think there can never be too many pumpkin recipes. Though pumpkin pie is my favorite dessert I can appreciate why your husband likes these better because having a grab and go dessert is really great. These look really tasty! I am yet to bake with pumpkin this time. 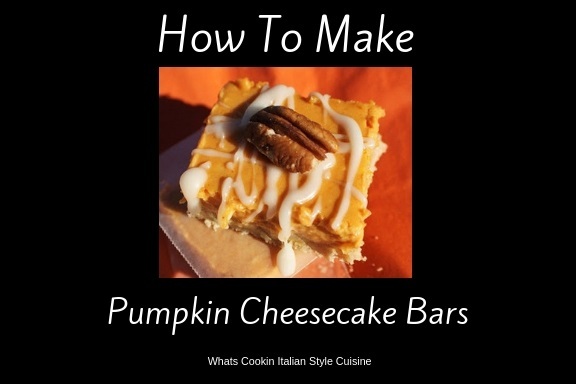 Your pumpkin cheesecake bars looks delicious . Perfect with pecan on the top, I like that you made with cake mix.